The aviation cocktail is a fantastic classic cocktail with a long and rocky past. 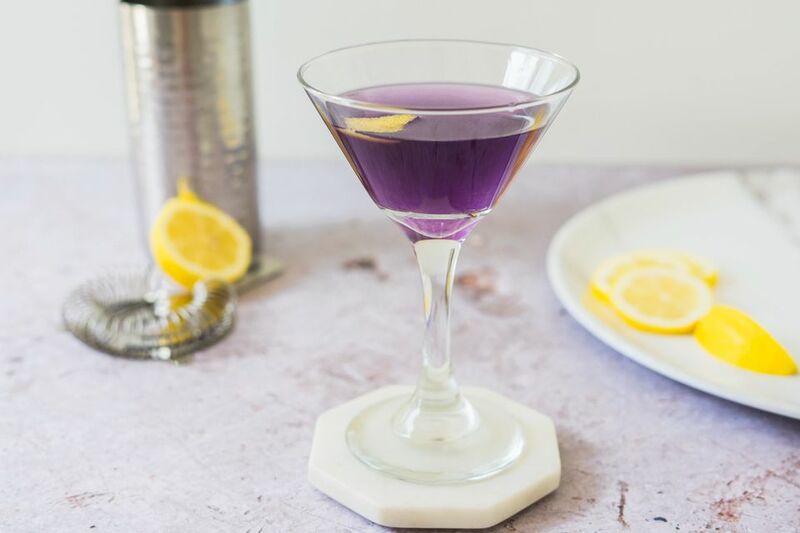 It's possible that this was the very first purple-colored drink and, without a doubt, it's the most popular recipe to feature crème de violette. This floral mix is simple, and in true old-fashioned style, it requires just a few ingredients. The combination of gin, cherry, violets, and lemon offers a refined and fascinating flavor that is unique in the cocktail world. The problem is that the key to getting the drink's stunning color is a somewhat elusive liqueur. Often overlooked and rarely stocked, crème de violette was revived with a 2007 release by Rothman and Winter. Today, a few other companies produce it, though it's definitely not the easiest liqueur to find. That liqueur makes the aviation cocktail what it really was meant to be, though even during the four decades of its absence, the cocktail was still being made without it. Interestingly, some drinkers have reverted to the maraschino-only recipe because they believe that modern crème de violette is not what it should be. Pour the gin, liqueurs, and lemon juice into a cocktail shaker filled with ice. Garnish with a flamed lemon peel. Beyond Rothman & Winter, look for violet liqueurs from Bitter Truth, Giffard, and Molinard. Best known for their drink syrups, Monin offers both a violet syrup as well as a liqueur. This cocktail is definitely a place to show off your best gin. Dry gins with a strong juniper profile are customarily used, though nearly any gin will work quite nicely. It's also a good idea to try it with Aviation Gin. Explore your options to find your personal preference, but always keep quality in mind. If you choose to skip the signature crème de violette, be careful about the cocktail's balance. Without this seemingly insignificant ingredient, the aviation can quickly become too sour. It's not known exactly who first created the aviation cocktail. According to David Wondrich's "Imbibe! ", it was first printed in a 1916 book by Hugo Ensslin called "Recipes for Mixed Drinks". It has always been difficult to gauge how popular the cocktail was at the time and because the two key liqueurs were likely just as rare as they are today, it is assumed that this was a specialty drink served at only the most elite bars. Sometime in the 1930s, crème de violette was dropped from the aviation and maraschino took over the drink. This can be noted in Harry Craddock's popular "Savoy Cocktail Book", which has been an influence on bartending guides since its first publication in 1930. Few cocktails beyond the aviation have called for crème de violette, and by the 1960s it had disappeared from the U.S. market. This sent the cocktail even further into obscurity until a recent cocktail renaissance and the re-release of the floral liqueur. Today you will find the aviation on lists of classic cocktails that should be experienced. Even so, don't expect to order it at every bar. Despite being available again, crème de violette is not part of the average bar's inventory, though there are some that are trying to revive the aviation and will create a fantastic version for you to taste. How Strong Is an Aviation Cocktail? Crème de violette is typically bottled between 30 and 40 proof, which is about the same as most maraschino liqueurs. Add to that an 80-proof gin, and you have a pretty strong cocktail. As lovely as it tastes, the aviation's alcohol content is a rather potent 27 percent ABV (54 proof). That's lighter than a gin martini and more along the lines of the cosmopolitan. What Is the 'It' in a Gin & It Martini Cocktail?